The elephant in the loch. 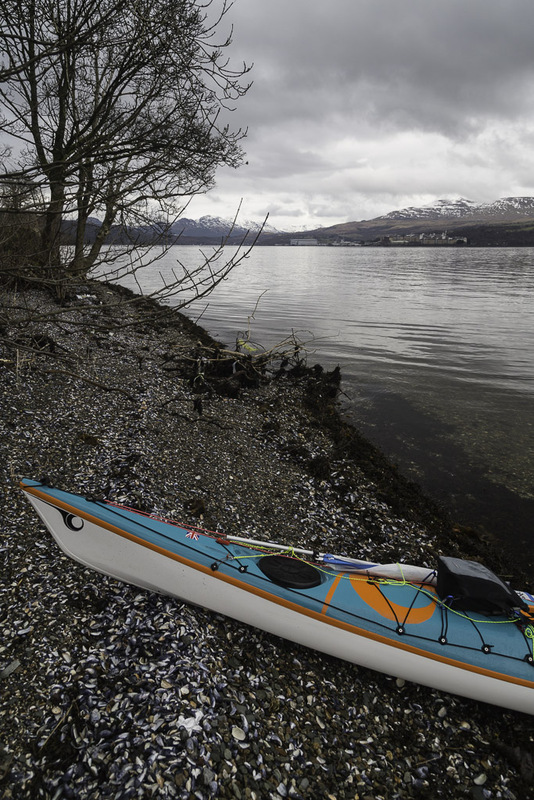 Once through the Rhu Narrows we paddled into the inner recesses of the Gare Loch. 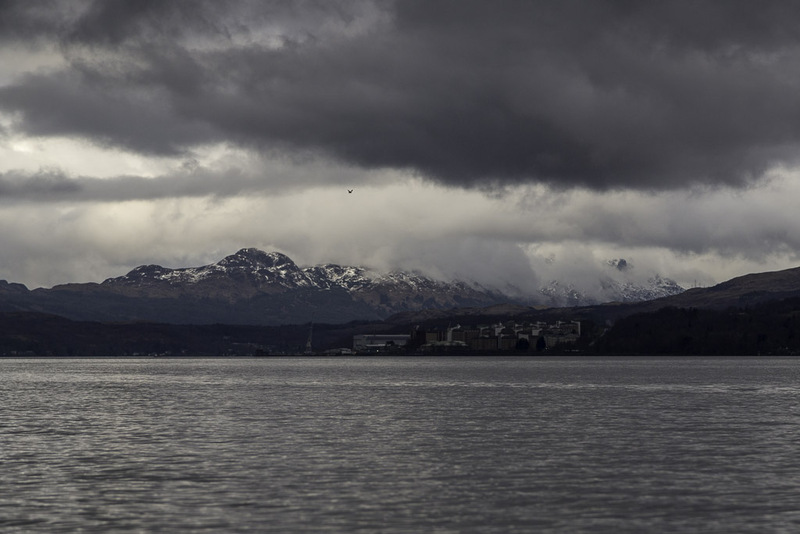 After the constriction of the Narrows, the scenery opens out here and moody clouds hung low over the snow flecked mountains of Argyll. 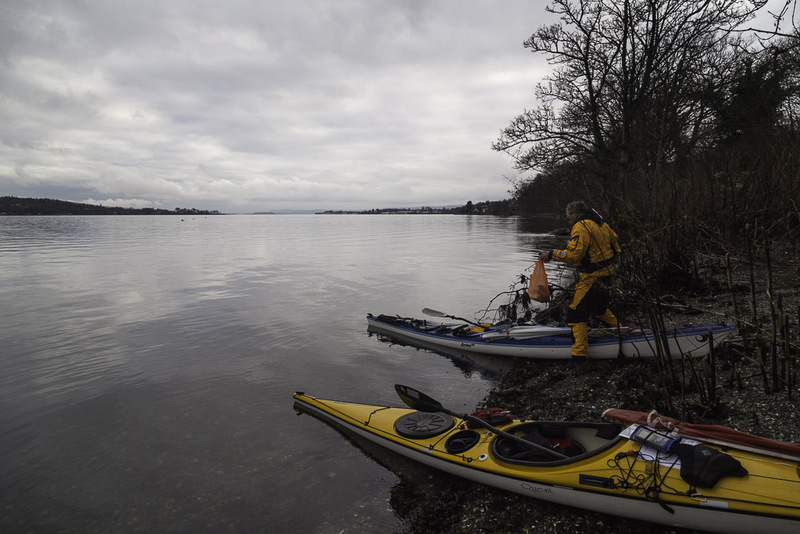 Although we were paddling on salt water, we were completely surrounded by land. Only the 250m wide Rhu narrows connected us to the Firth of Clyde and we were 120 kilometers from the open sea at the mouth of the Firth of Clyde. This remoteness from the sea and enclosed location was chosen to site HMS Neptune, the land based site for Britain's nuclear deterrent. We could see the base at Faslane Bay near the head of the loch. ...shingle and mussel shells. 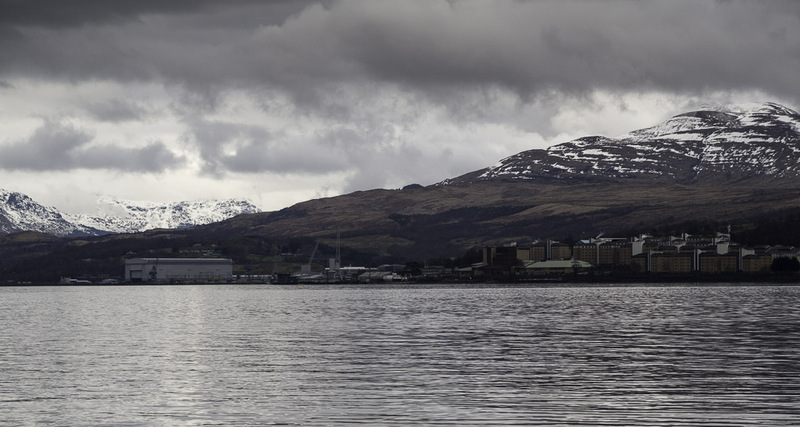 As we munched our sandwiches we looked over the Gareloch to the Faslane base. It was sited here to minimise the chances of a stealth attack by a Russian submarine. Some 6,500 service and civilian personnel work at the base. By the time you add in their families you can appreciate that this base is a very significant part of the economy of the west of Scotland. Of course it doesn't make ploughshares and so it has attracted much protest from CND since it was established in the 1960's. For many years there was a big Peace Camp at the gates of the base but enthusiasm for that seems to have died out a bit over recent years. In the late 1970's I did GP training in Helensburgh with an excellent GP called Dr Robin. He was GP to Faslane and arranged for me to get clearance to visit the base and see onboard a Repulse class Polaris carrying nuclear submarine and a smaller nuclear submarine with conventional armaments. I met a number of officers and crew and I doubt I would manage to live and work in such confined spaces for months at a time. The Repulse class submarine was cramped but the conventional submarine had a tiny living space, almost all the internal space was filled by tubes and machinery. 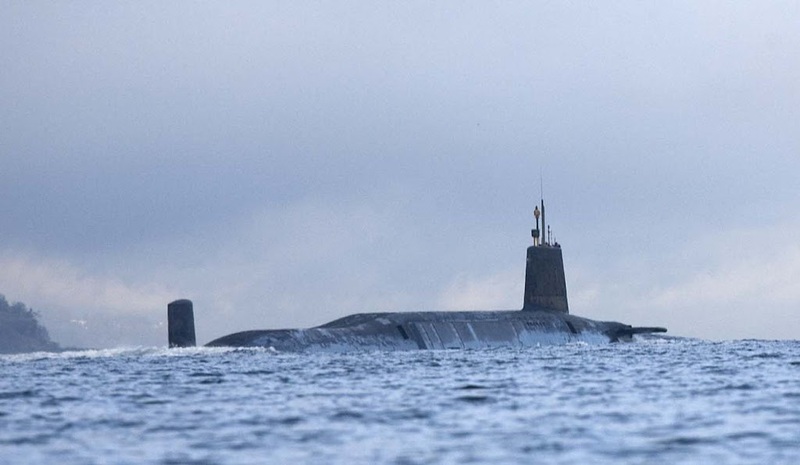 This is one of the current Vanguard class of Trident missile carrying nuclear submarines making her way up the Clyde to Faslane. It could be HMS Vanguard, Vigilant, Victorious or Vengeance but I don't know which. Subs like these do not have name or number plates. 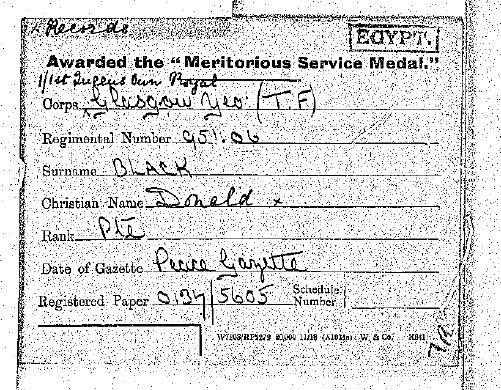 ...meritorious service in Egypt during 1915. He went on to fight in Gallipoli where he was left for dead after the shell struck. He was so affected by what he had experienced in the war that he never discussed it afterwards and never told anyone about the medal. We only discovered about the medal 99 years later. I believe that the presence of Faslane has helped to avert further war during the "Cold War" years and so (paradoxically as a pacifist) I support its presence. I wonder how the many thousands of people who work there will be voting in the independence referendum?